This is the perfect Slideshow maker software that can help you transform your stunning photos and videos in into mind-blowing slideshows complete with music as well as 2 and 3 dimensional effects. You can easily share your slideshow on TV and YouTube as well as on Facebook and even on your mobile device. The iSkysoft Slideshow Maker is easy to use for Windows users. Once you have downloaded and run the software you can choose between Advanced Mode and Standard Mode. 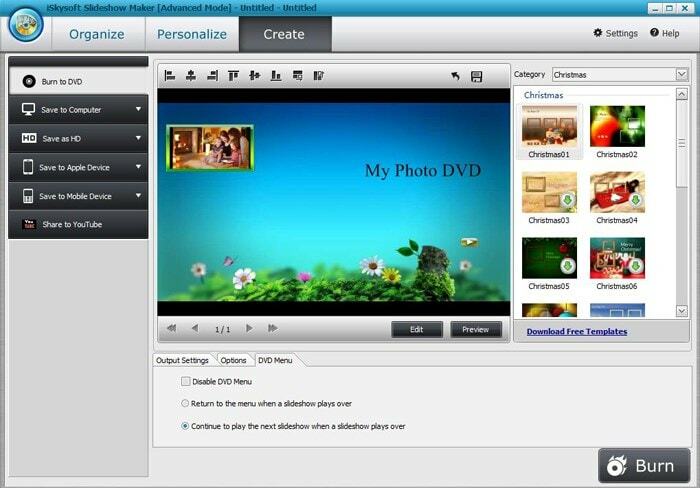 The former offers more customization options while the other one will help you to quickly make your photo movie. To add photos and videos and to customize your slideshow you need to use the Advanced Mode press Add Files and then choose your photo or video file. Click on Personalize to customize your slideshow. You can also think about using Choose DVD menu to author your very own impressive DVD menus. To publish your slideshow you will need to simply click on the CREATE button. You can also save your DVD slideshow and by clicking on Burn to DVD. To save it as a video slideshow you must click on SAVE TO COMPUTER. To watch your slideshows on your device you will need to click on SAVE TO MOBILE DEVICZE or SAVE TO APPLE DEVICE. If you are interested in publishing your slideshow on YOUTUBE you must click on SHARE TO YOUTUBE and after that you will need to provide your YouTube account information after which you have to click on PUBLISH. If you wish to burn the DVD for television then first click on the EDIT button and then customize your DVD. Next, in OUTPUT SETTINGS, you will need to check the option that says Burn to DVD. You can choose how many copies to burn and you can also make your own ISO Image files. Just ensure that the PAL or NTSC TV standards are the right ones. If you choose the wrong option then incompatibility issues will mar your playback. Lastly, simply press on START and your slideshow will be burnt to TV. Once this is done, you can then insert the newly created DVD into a DVD player and then you can enjoy countless hours of entertainment as you watch your slideshow on TV.